Philadelphia – April 5, 2019 – Senators Vincent Hughes (D-Philadelphia/Montgomery), Art Haywood (D-Montgomery/Philadelphia), Sharif Street (D-Philadelphia), and Lindsey Williams (D-Allegheny) stood with local activists and advocates to announce the Senate Democrats Call to Action on the Crisis of Poverty and Economic Insecurity. The call to action began April 4 as a tribute to the Rev. Dr. Martin Luther King and his work for poor and working-class people prior to his assassination. The Senate Democrats held events Pittsburgh, Reading and Scranton announcing the call to action as tribute to King’s fight on Thursday. 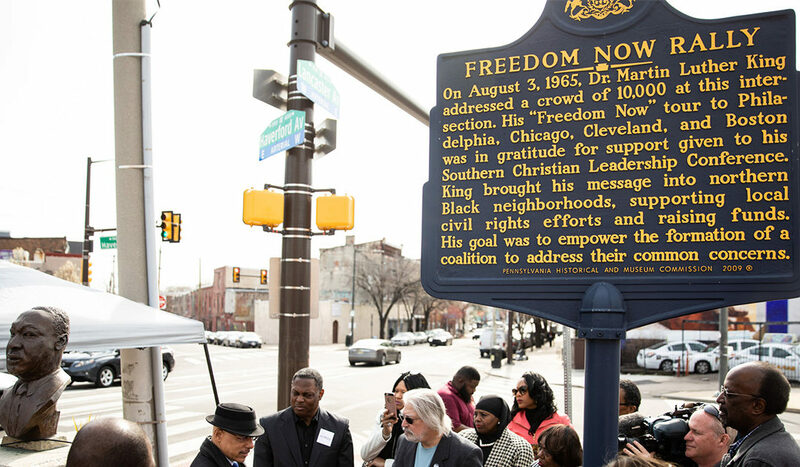 King’s legacy helped spark the flame for the campaign, with members finding parallels between poverty issues of today and those when he fought to bring economic justice to the U.S. The civil rights leader had traveled to Memphis to support the Sanitation Workers’ strike and was in the midst of launching the Poor People’s campaign nationally at the time of his assassination. “The fight for economic justice did not end with the Memphis sanitation workers and the assassination of Dr. King. In my office yesterday, home care workers cried out for decent pay,” said Senator Haywood. “Today, we continue the fight with our campaign to raise the minimum wage above the $10 per hour they are paid to at least $15 per hour. As Dr. King said, ‘It is a crime for people to live in this rich nation and receive starvation wages.’”The statewide Call to Action on the Crisis of Poverty and Economic Insecurity will to examine 30 issues related to poverty and economic security that the Senate Democrats are working on this legislative session. Each piece of legislation, whether it is a minimum wage increase or better access to affordable childcare, is intended to help improve conditions for Pennsylvania’s impoverished communities. The senators were joined by representatives of the POWER Interfaith, Philadelphia Urban League, SEIU, UNITE HERE, We the People Pennsylvania, and Raise the Wage Pennsylvania. Following the press conference, the senators went to Chosen 300 for a brief worship service and community action through Chosen 300’s ministries. For more information about the call to action, including a list of events during the 30-day campaign, visit pasenate.com/mlklegacy.